Slots around Greek mythology always has a certain appeal to players and Zeus is certainly among the top slots. He was the God of the Sky and Thunder and the God of Gods on Mount Olympus. The original Zeus was very popular and the enhancements on the third version will be welcomed by all Zeus fans. These include 6 reels and 192 pay lines with a good betting spread starting from E0.30 and going up to E150 – so if you are conservative or ambitious you will be accommodated. Betting is done on a special panel displaying the per line bet. The graphics displayed are excellent and you will agree that Zeus looks particularly fearsome. Other icons include Pegasus as well as a helmet a vase and a harp. Gold and silver coins also feature. Free Spins is what to chase on this slot and spin at least 3 of the “lightning fist” and you are awarded 10 free spins – should you spin 4 you get 25 free spins and if you are very fortunate and trigger 5 of these symbols you will win 100 free spins. Free spins can also be re-triggered. Trigger 3 of the other symbols on a bet line and you win cash. 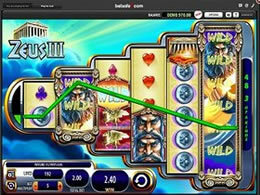 Zeus lll is an exciting game especially when you are chasing free spins Try it you will not be disappointed! !